In general, Mizuno shoes have great uppers and not so great, soft compressible EVA midsoles or lowers. 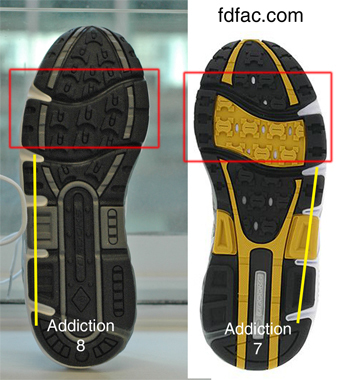 Because of this, they tend to wear out more quickly then other shoes having more firm medial (inner) EVA outsoles. CF brought in her Mizuno Wave Wrider 11 shoes in today for evaluation after she started having heel pain while training in them for the Nike Women’s 1/2 Marathon. The shoes were less than 3 months old and barely had 150 miles on them, when the pain started. Fortunately she purchased a new pair for the event and although the pain did not go away, it did not get worse after the Marathon . The above image shows her 3 month old shoe on the left and her new shoe on the right. 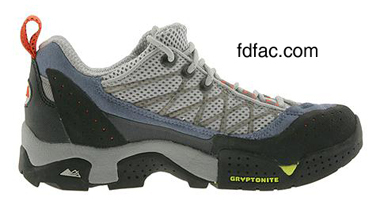 Notice how the left shoe is listing to the outside (lateral)? This is because the white EVA midsole has compressed, which tilts the shoe, holding the foot in less than optimal alignment. 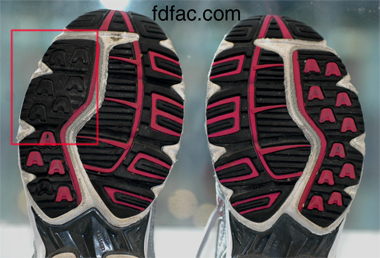 The image above shows asymmetric wear in the old shoe with the right shoe outsole being entirely worn off (no pink tread), making the outer forefoot less durable and more likely to pronate, resulting in heel pain or plantar fasciitis. 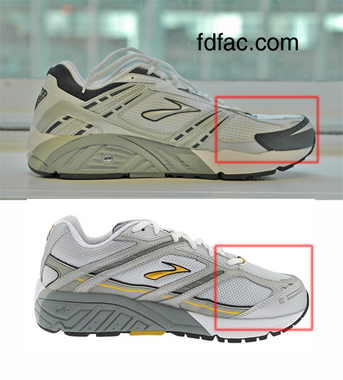 In this case, even a relatively new shoe can cause foot pain and problems while running. 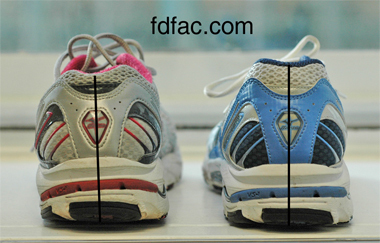 If you wear Mizuno’s, especially the Wave Rider 11, you will want to evaluate your shoes for signs of excessive wear at least monthly. If you have a narrow foot then I don’t have to tell you how frustrating it can be trying to find a pair of boots that fit. If you’re looking for a stylish, waterproof boot, then Aquatalia’s Wasabi knee high boot is not only fashionable but narrow and shallow as well. 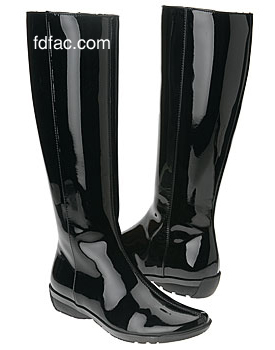 It has a great rubberized sole to help with shock absorption and will get you through even the wettest days. 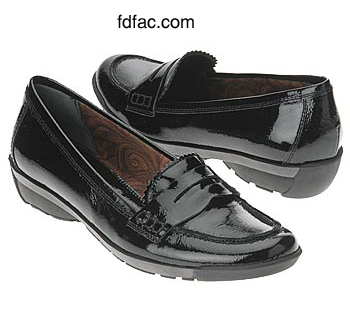 Aquatalia also makes a patent leather loafer on the same last, with the same low volume upper and narrow outsole – Whoopie3 which is shown below. Aquatalia’s website is http://www.aquatalia.com/ Check it out for new styles! For those of you who love the ease of ordering from Zappos.com, you may want to check out their other site, http://www.6pm.com/ which features the same multi-view shoes as Zappos.com, only at deeply discounted prices. The shipping policy is not as liberal (free outbound only with orders over $100) and their return policy is shorter (30 days as opposed to 365), but given the deals to be had, this site is well worth it. Finding shoes to accommodate an orthotic can be a challenge. If you are ordering orthotics, be sure to show your podiatrist the shoes you plan on wearing them in, so that an appropriate pair can be made. If you’re primarily wearing flats and your orthotics are made for tennis shoes, they generally won’t work in your flats. 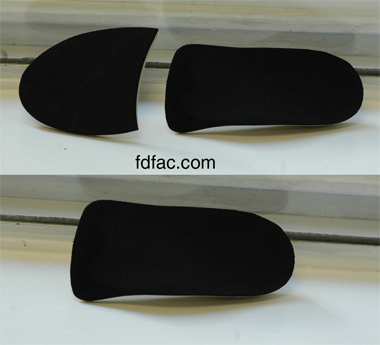 On the other hand, if you already have orthotics the profile may be able to be reduced, i.e. narrowing and/or removing length. A 3/4 length orthotic works just as good as full length orthotic, so shortening can usually help. The below images illustrate this principle. Unfortunately, most non-athletic shoes will not accommodate an orthotic. 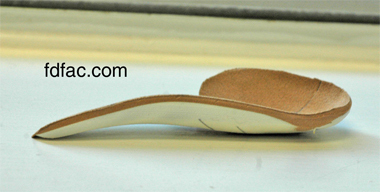 Typically orthotics are too bulky unless your podiatrist orders a “dress shoe” or lower profile pair. This type of device is illustrated below. If you never wear athletic shoes, then this is the type you should have for your shoes. This style of device is sometimes called a cobra based on the design shape. An orthotic made for a pair of flats or dress shoes will never be as good as a pair for athletic shoes, so if you can it is always best to have both pairs. Generally the 2nd pair is not as expensive as the first which helps. 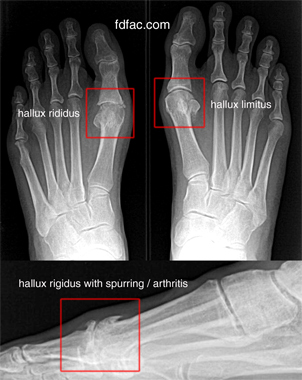 I addressed squeaky orthotics in a prior post https://drshoe.wordpress.com/2007/12/27/squeeky-orthotics/ which illustrates how to apply tape on the underside of an orthotic to stop squeak. When tape works to eliminate squeak but won’t stay put, the best thing to do is have your podiatrist permanently glue a piece of leather or vinyl to the underside of the orthotic in the same place where the tape was. 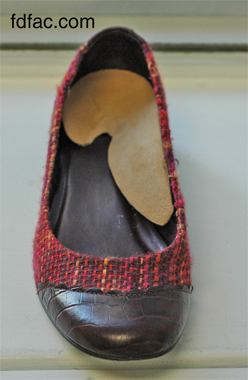 Typically Barge (shoemakers waterproof glue) is used. If your podiatrist doesn’t have the necessary materials then your local shoe repair store will.